Vous en apprendrez plus sur les paysages de l'Antarctique, la faune et les explorateurs avec vos billets pour le Centre international de l'Antarctique à Christchurch, une expérience primée qui combine divertissement et pédagogie. Essayez d'affronter une rude tempête de l'Antarctique, puis apprenez-en plus sur la vie sur la base Scott isolée et passez un peu de temps de qualité avec les adorables petits pingouins bleus du centre. Profitez des manèges Hagglund et des spectacles en 4D, et entrez dans la « zone des câlins », où vous pouvez rencontrer, vous blottir contre et caresser les moelleux Huskies que les explorateurs ont historiquement utilisé pour tirer leurs traîneaux à chiens sur l'Antarctique. Meh. We arrived when a couple of cruise ships had tours. It impacted the whole day. They didn't offer the backstage penguin experience, and there just really isn't much to see or do. The ride is through a parking lot that will definitely cause back issues for a couple of days. Although I was happy to support a worthwhile cause, researching and demonstrating what we know about the antarctic, the experience is rather lame. This is a great attraction. I think it is a bit pricey for what you are getting there, but really worth seeing. There is a lot of information and reading to do, and the person at reception really does a great job of helping you maximize your time there. I highly recommend the Penguin Encounter, but do be aware you will not handle any live penguins. 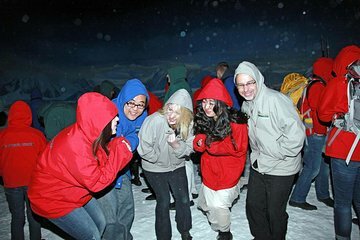 Visiting the Antarctic Center is a little pricey but I would highly recommend you to visit it, especially if you have a friend with you to share the fun. I loved the hagglund ride! It was my highlight and was a great start to the visit of the Antarctic Center. The wind chill simulation was entertaining too, however, if you have experienced super cold temperatures before you won't be as impressed. I found the Antarctic Center educational and left the center with the idea of visiting the Antarctic one day. We absolutely loved the tour, the only problem was that I booked through the shore excursion option not realising that Akaroa where our ship was docking was so far from Christchurch. However one of the tour people enabled us to go on their tour from Akaroa to the IAC just paying the coach fare and using our own entry ticket. So a big thumbs up to the great tourist relations in Akaroa.